A masterkey setup will expand the functionality of ChronoScan by using static value Intelli-tags generated from a master vendor database provided by the user using the Accounts Payable Wizard to detect the supplier or vendor for each document. 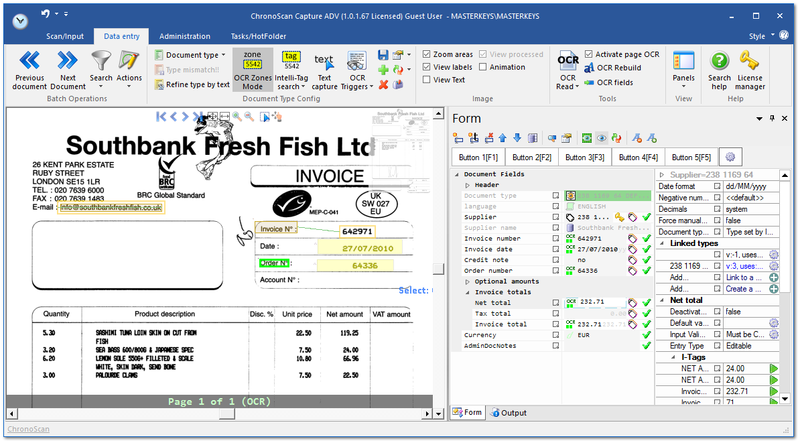 After the supplier/vendor detection takes place ChronoScan will then proceed to detect the document type using the IDR engine as normal. Mastekey support is enabled only for ADVANCED and ENTERPRISE licenses. ADVANCED licenses will support a master vendor database of up to 500 vendors, ADVANCED+ licenses will support up to 1000 vendors and ENTERPRISE licenses will support an unlimited amount of vendors but have a PPY (Papers per year) pricing. The first advantage of using a masterkey setup is in the time and reliability while detecting document type, specially for larger setups with many document types. Because ChronoScan will first try to identify the vendor and later identify the document type it takes much less time to identify types as document types will now be linked to vendors. Another advantage is that each vendor will have specific settings for things like decimal separator, date format and masterkey specific intelli-tags for instance. On a masterkey setup documents coming from all around the world can be processed on the same Job without compatibility issues that would otherwise require a different job to be setup. There are other interesting features that come from a masterkey setup such as the possibility to disable specific intelli-tags according to criteria such as the existence of other intelli-tags or for certain vendors only. 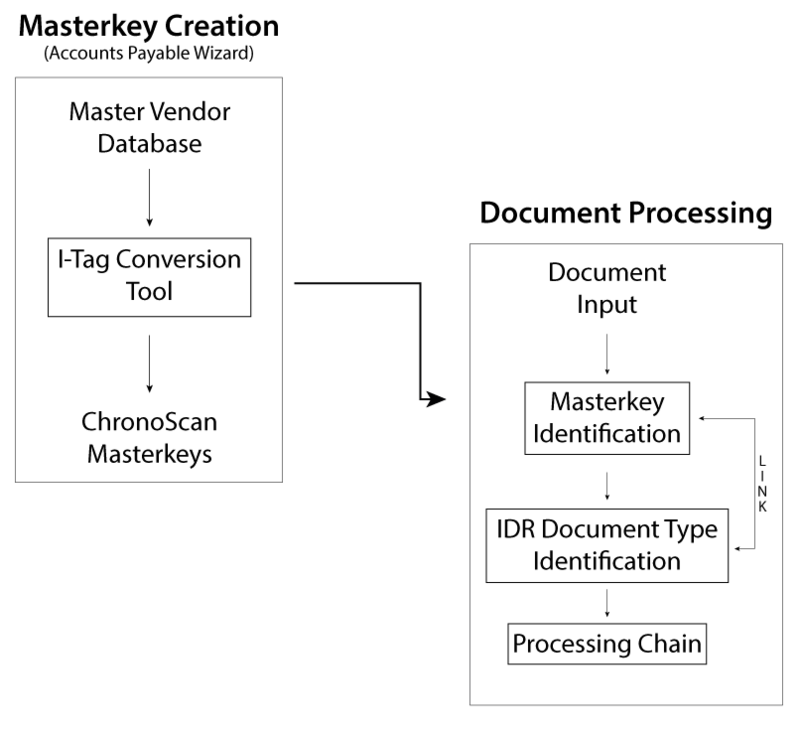 When there is more than one match for an intelli-tag the user selection through the blue selection arrow (Intelli-tag selection tool) will be actually recorded and will be used for other documents of the same vendor, also being used through reprocessing steps. Those and many other advantages come from using a masterkey setup and the ChronoScan team do recommend it whenever there is the possibility to use it for bigger setups. Masterkeys are created while creating a masterkey setup using the Accounts Payable Wizard. They are nothing more than a special kind of static value Intelli-Tag that will be run before detecting the document type as it can be seen on the box to to the right on the Document Processing steps.